The process leading to a Civilian Compact calls for a deeper understanding of the strengths and shortcomings of the civilian dimension of the Common Security and Defence Policy, as well as on how it could be improved. The conference addressed this theme in three sections: after a brief overview of the status quo of the Civilian Compact, the focus moved on the experiences of other international organisations, and on how the EU can cooperate with them. The final section provided inputs from the EU missions in Libya, in the Sahel region, and in the Mediterranean (Operation Sophia). 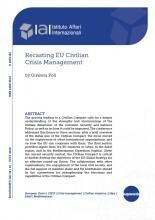 Given the current security context, the Civilian Compact is critical to further develop the objectives of the EU Global Strategy for an effective joined-up Union. The collaboration with other organisations, the engagement of the local civil society, and the full support of member states and EU institutions should be the cornerstone for strengthening the functions and capabilities of the Civilian Compact.